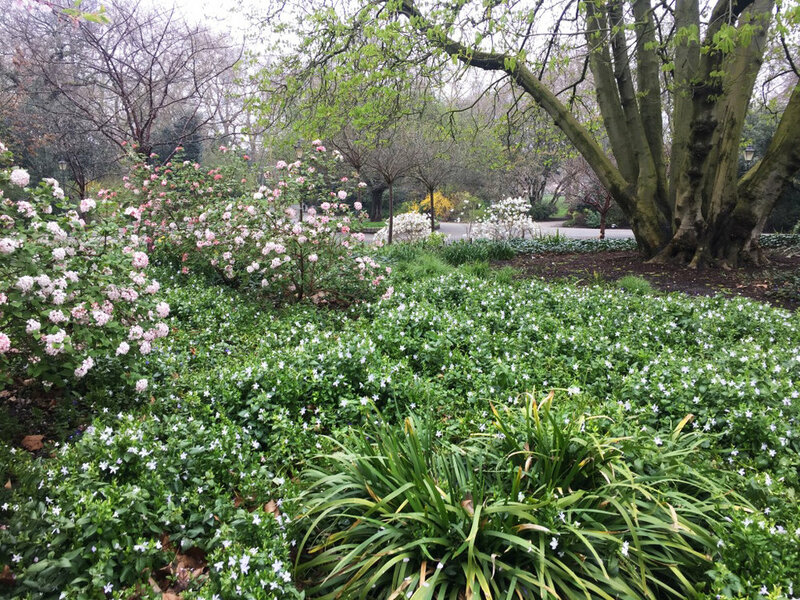 Yesterday our very own Sam Martin lead the ExA London Office on a planting design walk by means of a lunchtime visit to Battersea Park’s ‘Winter Garden’, located in the South West corner of the park just inside the Sun on the corner of Prince of Wales Drive and Albert Bridge Road, right on the office back doorstep. The garden was designed by Dan Pearson in 2004, who was inspired by the existing mature tree coverage to create a Winter Garden; by removing some of the overgrown shrub layer, opening up views of an otherwise over looked area, and creating a garden that comes alive over the months when the rest of Battersea Park lies dormant. Dan wrote in the Daily Telegraph in March 2011 “the Winter Garden will provide a space in the park that is at its best at the lowest point in the year, celebrating winter with an ample selection of plants that come into their own between leaf-drop and budburst”. There was also a deliberate attempt in the garden design to select unusual plants to add to the sense of delight – examples being the “orange and rust witch hazel and the autumn flowering Camellia sasanqua, crimson Chaenomeles and bloody Hamamelis ‘Diane’. Scent is also a key part of the garden through the generous use of Daphne, Sarcococca, Chimonanthus with Viburnums and Lonicera placed near seating areas. The central pathway that leads from west to east takes the visitor from light to dark as the path passes through The Clearing and under the Parrotia Oval, then through the existing taller deciduous trees and large Ilex and Taxus trees. The garden is to be seen from all aspects and for all seasons but at it’s best in Winter, when many of the species are at their most beautiful and fragrant. We highly recommend a visit in the coming few weeks while the garden is at its sensory peak!